Well, welcome back to the One Room Challenge. We are onto week 3! If you are new here, you can read pop over to week one and week two to see my inspiration and ideas for my kitchen makeover. I am participating as a guest participant for the One Room Challenge along with hundreds of other amazingly talented bloggers and influencers! 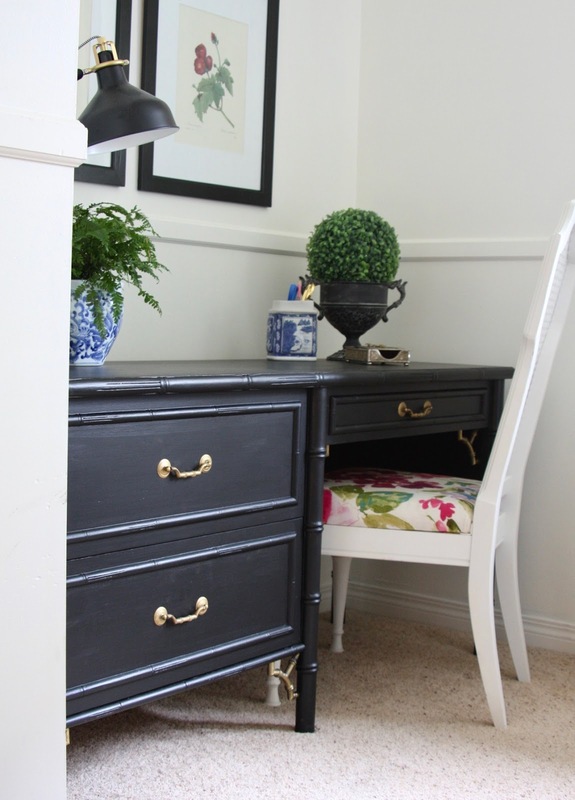 The One Room Challenge has 20 featured designers that you can follow along as well! My guess is you want a kitchen update?? Nothing too exciting happened this week. The ONLY thing I managed to do is to sew all 3 Roman shades. They will look like this shade I whipped up last year! They aren't going to get mounted until I am finished stencilling the backsplash. The stencil and supplies from Cutting Edge Stencils were shipped out last week, and arrived yesterday! Yay! I decided last minute to refinish our vintage kitchen table which is a library desk from the 1920's. After asking on Instastories, it seems the consensus is to stain it dark walnut like my coffee table or this table I refinished for my daughter last summer. The shiplap from Metrie still needs to be applied onto the island, I just need a free weekend with NO houseguests. I have my daughter flying in this Easter weekend. Last weekend my brother-in-law was visiting. I am hoping to sweet talk my lovely hubby (who isn't a fan of DIY projects) to help me install the shiplap on the kitchen island. Last week I snagged some stools for the island and I'm going to strip the seat and stain walnut and then paint the legs matte black. 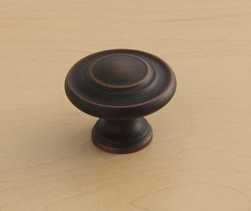 I'm still hunting for affordable cabinet knobs. I need 50 and since we are renting this house, I don't want to spend too much. I kind of like these from Lowe's. 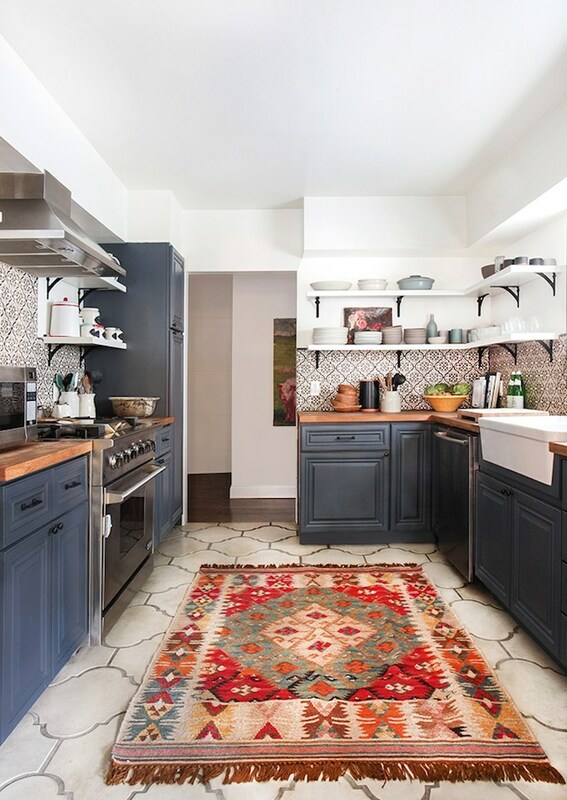 The best part of the kitchen makeover arrived this week, the gorgeous wool rug from ECarpet Gallery! It is simply stunning! Wish me luck in getting more accomplished this week! Yikes! Welcome to week 2 of the One Room Challenge! If you are stopping by for the first time, welcome! 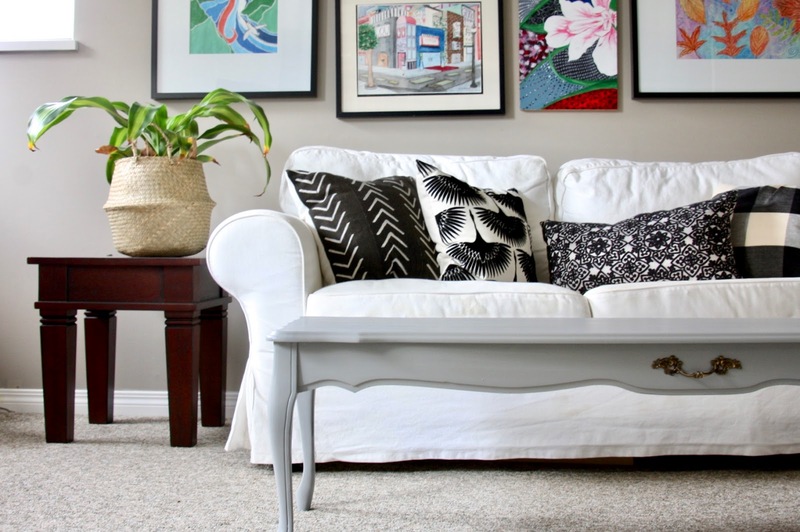 This is week 2 of the One Room Challenge where you have 6 weeks to makeover a space. I am a guest participant but there are 20 bloggers/influencers who are featured every Wednesday. They knock my socks off every as do guest participants! It is such an inspiring event. If you want to start at the beginning, pop over to my week 1 post! In the last minute, I decided to makeover our kitchen on a shoestring budget. We are renting, so we can't renovate, but for the past 4 years I have been scheming how I can add a bit more personality to the kitchen. We have partnered with Metrie and Cutting Edge Stencils to add that layer that this kitchen needs. Shiplap is going onto the kitchen island and the backsplash is being stencilled. I finally chose a wall stencil from Cutting Edge Stencils thanks to my followers on Instagram who helped me decided between two patterns! I went with the Florenza tile stencil in a 6" x 6" size. Now I need to find paint to match our counters, I don't want stark black but a more softer muted shade. The fabric and lining have been cut for the Roman blinds. I purchased all the "bits" needed, like dowels, brackets, etc. Would you believe the fabric I am using is actually drapery from Ikea? When we moved in, I removed the horizontal blinds from the large picture window in our kitchen and hung Ritva drapes from Ikea. I bought another package of drapery to use to make the Roman shades so they will match. 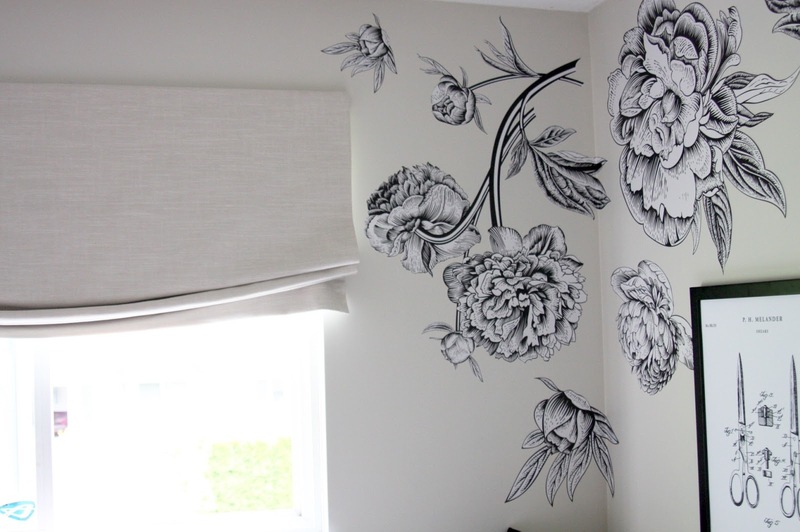 As well, I want to keep the window drapery neutral as the wall stencil is quite busy. I'm creating blinds just like the ones I made for last year's One Room Challenge. After searching for a few days, I finally found the right sized runner rug (I needed about 2' x 8') and with the right colours! I ordered it through E-Carpet Gallery (not sponsored). I stumbled across them via Cat Theirren's Instagram account. They have affordable Persian rugs and the best part - shipping was FREE!!!! For us Canadians, that is a BIG DEAL! Another score this week were vintage oak counter height stools that have similar lines to my kitchen chairs. They will get painted with Fusion Mineral Paint in Coal Black! Or maybe another punchy colour, like navy....not sure. I am kind of winging this makeover as I go along. Hope you stick around and come back next week to see what I come up with next! If you want more up-to-date info, follow along on Instagram and Instastories! Click on the icons on the top menu bar to find me! I've been on the fence about joining in the One Room Challenge and decided to throw in my hat again as a guest participant. Having made over my son's room into my sewing room last year on a tight budget, I am inspired to spruce up our rental kitchen. 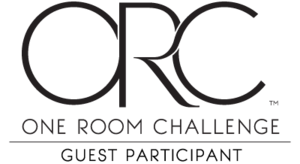 For those of you who don't know, the One Room Challenge is where you makeover a room in 6 weeks. Better Homes and Gardens is co-hosting! 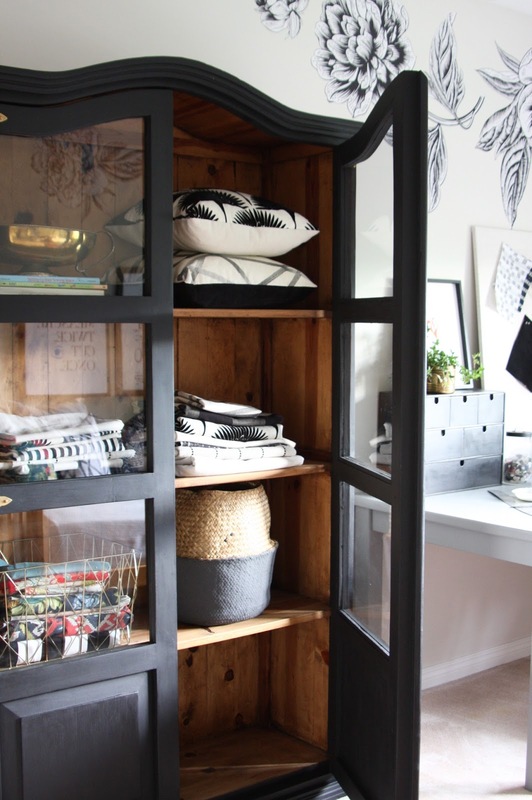 Every Wednesday, 20 featured designers and influencers post the updates on their room makeovers. On Thursday, guest participants link up their projects! There have been some amazing room makeovers in the past. Can't wait to see what this season brings!! We have been in this house for 4 years, still renting since moving back to Canada 10 years ago. This house we are in currently, received a cosmetic renovation before we moved in, but the kitchen is lacking character. My plan is to give this space some character without breaking the bank. 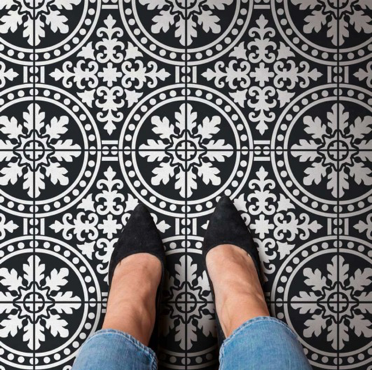 Living in a rental doesn't mean you have to sacrifice style. 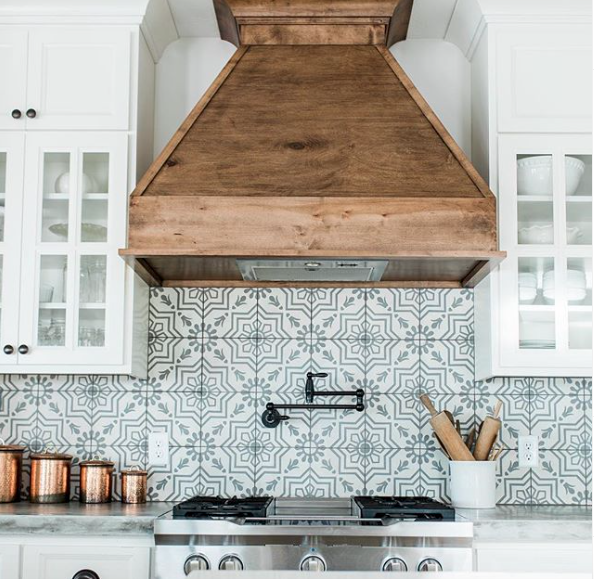 Follow along as I add a bit of style to our lack lustre kitchen using shiplap, fabric, wall stencils and accessories. I am excited to be partnering with Metrie who have supplied the shiplap that I will install on the kitchen island. I'm still deciding on a wall stencil pattern and sourcing new hardware. The blinds are being replaced by relaxed roman shades, just like the ones I did for my last One Room Challenge makeover. The cabinets are not in the best of shape but I'm leaving them as is, instead I am switching out the knobs for something prettier! The current state of our kitchen, blah and boring. Come back next week and, fingers crossed, I have made some progress! Despite my lack of consistent blog posts, I somehow managed to finish a few projects this year! Blogging has taken a backseat as my day job and the grad classes I am taking are occupying a lot of my free time lately. Not to mention, blogging seems to be a different creature than when I started 9 years ago. Instead I focus on what I love - finding vintage thrifty finds and breathing new life into them. Here are some of my favourite projects of the year along with my favourite paint brands that help me paint it beautiful! 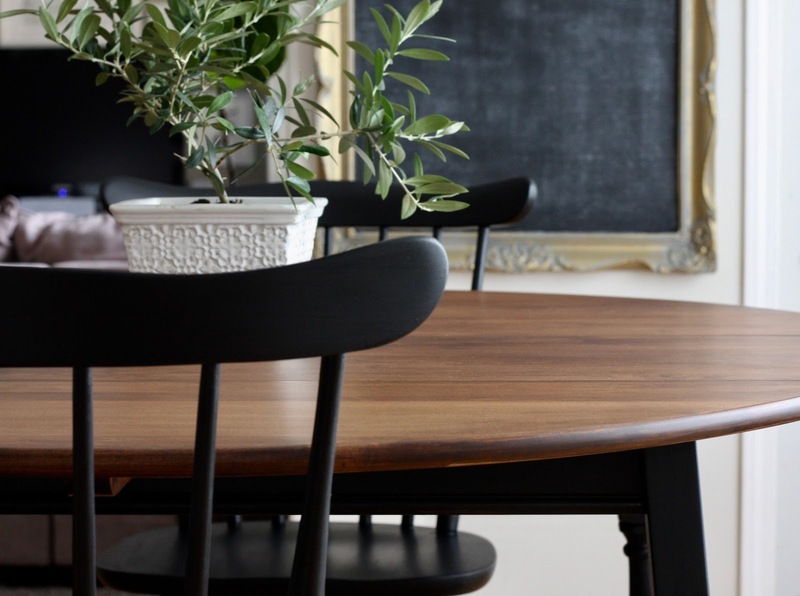 The brands I got to work with this year, are brands I LOVE to use when revamping furniture. Here are my top 3! Rustoluem Canada and their plethora of products! The first two brands, carry what I like to call "boutique style" paint. They are paints that are made in smaller batches and give your furniture a specific look. FAT paint is more for the shabby aged look and Fusion Mineral paint gives you a fabulous matte patina. This $100 cabinet that weighs as much as a piano turned out beautifully with FAT Paint in Raven and their black beeswax. 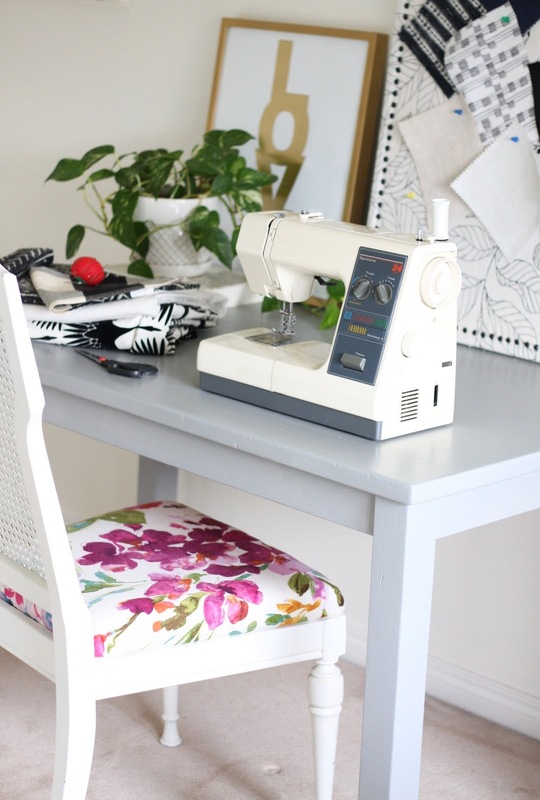 It is the highlight of my sewing room makeover for the One Room Challenge. You can read more about the room here. In the spring I was asked my Fusion Mineral Paint to try out their Tones for Tots line and was hooked by this fabulous paint! Using Little Lamb I revamped this ugly pine table for my sewing room. You can read the post here. In the early summer I stumbled upon these chairs along with a table for only $60! 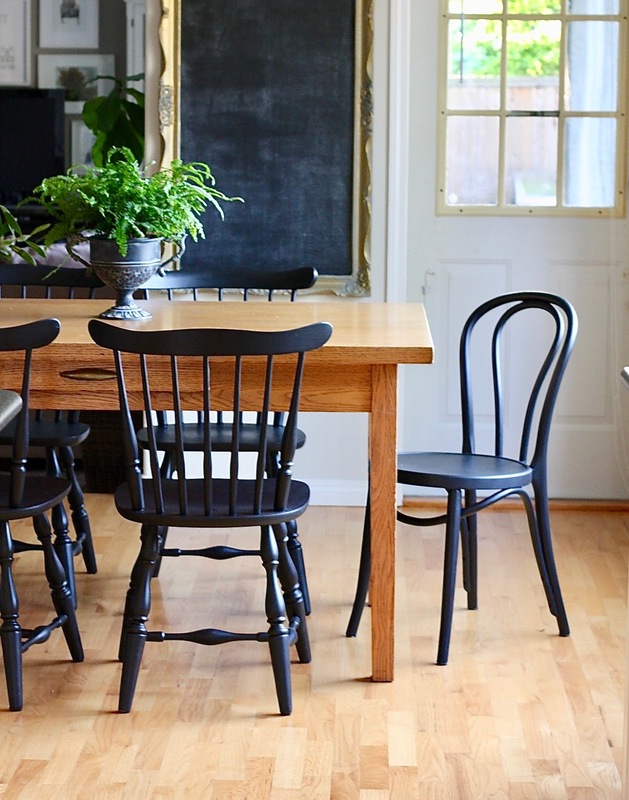 I painted the chairs in Coal Black by Fusion Mineral Paint. I love, love, love them! The table that came with the chairs got a revamp as well. The glossy 70's varnish was stripped to reveal a gorgeous solid maple top that was stained with Varathane in Walnut and sealed with Varathane's Diamond finish in matte (all products by Rustoleum). 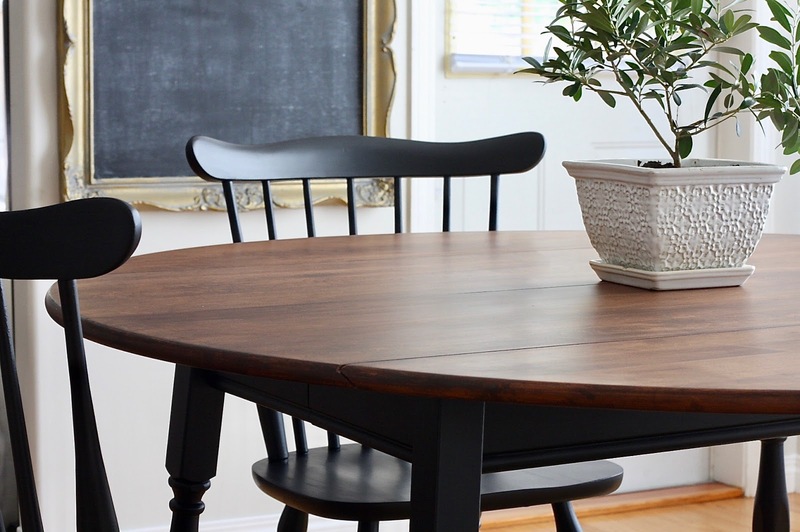 You can read about this table's makeover in this post. A friend of ours found this coffee table lying on the side of the road and dropped it off. I gave the table a coat of Fusion Mineral Paint in Little Lamb and then sold it on Facebook Marketplace. And if you follow me on Instagram, you would know I found this beauty for $45 and managed to cram her into the back of my Honda Fit. She received a paint treatment with Fusion Mineral Paint in Coal black, a top coat of Varathane's Diamond Clear Coat in matte and the handles were give the Midas touch with Rub 'N' buff in European Gold. With 2019 upon us, I have a few neglected pieces in the garage waiting for makeovers and hope to keep my thrifty eye on the look out for more pieces!